"... for their refurbishment of the Spike as a community and heritage area. This community-driven project, with support from the Heritage Lottery Fund, has returned this long-neglected, threatened historic building to public use for local people and visitors to Guildford, now with a vital education role." This award, more than anything, is in recognition of all the volunteers and supporters who helped make the Spike what it is today. Guildford MP Anne Milton accompanied by the mayor of Guildford Jennifer Jordan in the presence of many of the people involved with the project including representatives from English Heritage and the Heritage Lottery Fund. 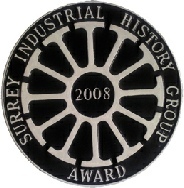 Spike's first award was from the Surrey Industrial History Group and a very prestigious award to have rating the Spike alongside other historic buildings such as Farnham Maltings, the Rodboro Buildings and Cobham Mill. It was the 26th award given by the Group and was presented to John Redpath by Bob Bryson Chairman of SIHG. 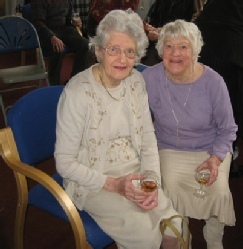 Our first true community event since the January opening saw many long established residents, and those who had moved away, meeting up to chat over old times and their life living in Charlotteville. This was a really great event and made all the hard work of re-establishing a community centre seem so much more worthwhile. 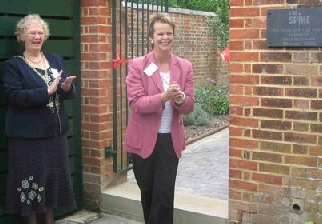 The Community Centre was opened by Pat Beasley and Martin Moss. Martin had been one of the earliest supporters of a community centre at the Spike and his positive attitude and daring quotes ("You can make a community centre in any building") kept us going. Pat is one of our long distance supporters from the Midlands and won the scissors to open the Spike at the Burns Night in 2006.